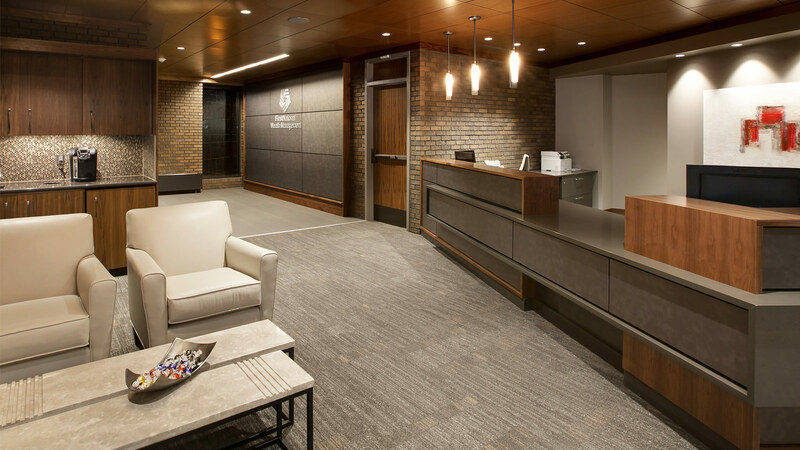 Changes in the banking industry and a desire to offer clients a more personalized experience motivated leaders at The First National Bank in Sioux Falls to launch a floor-to-ceiling renovation of its main Wealth Management Services office. 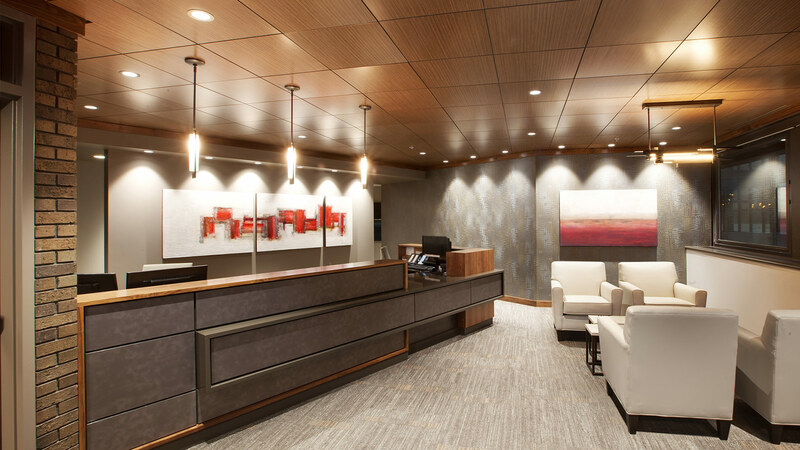 The department is in the same location—on the fourth level of the bank’s downtown branch—but the spaces themselves have undergone a dramatic transformation. Formerly known as the Trust Department, Wealth Management’s new name more accurately reflects the range of services FNBSF provides. The look is warm and welcoming, with pops of FNBSF’s signature red and ample interior glass to allow daylighting to penetrate from perimeter windows. The effect softens the existing structural brick walls, which are offset by wood tones that bring in a natural element. As staff and visitors step off the elevator, they no longer look down a hallway. They’re greeted by a receptionist and an open lobby. 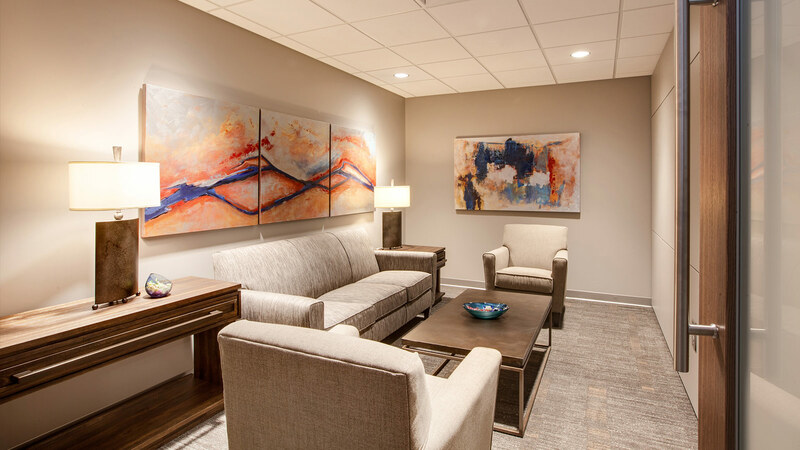 The overall design combines fresh, clean lines with modern furniture, carefully selected artwork, updated flooring, and vinyl wall coverings instead of paint. 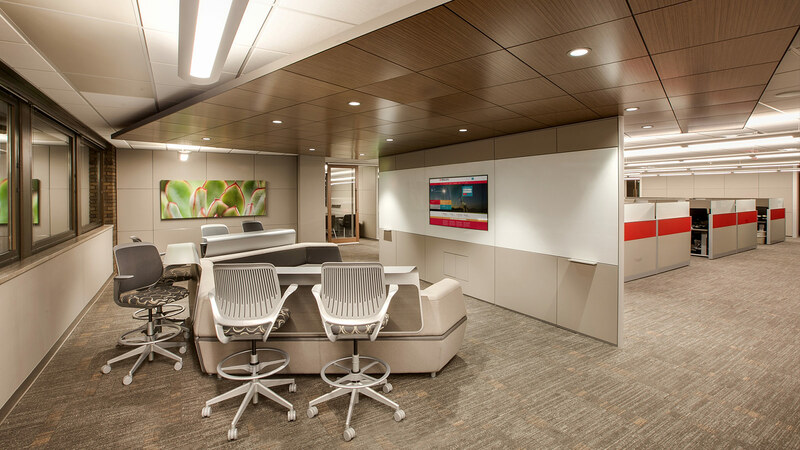 It was important to bank leaders that the finished spaces be inviting as well as soothing. Often, families who need to set up trust documents unexpectedly are doing so during times of stress, grieving, or both. A “living room” with a more intimate feel offers a private setting for these clients to consult with their trusted advisers. 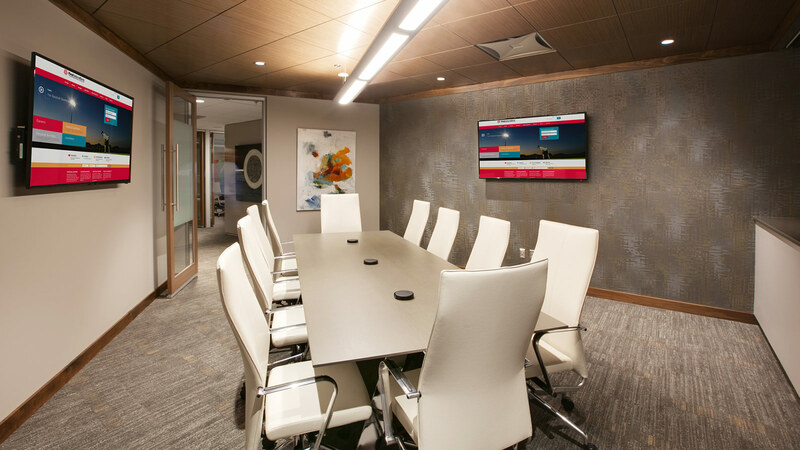 Other changes were designed with employee efficiency and comfort in mind. 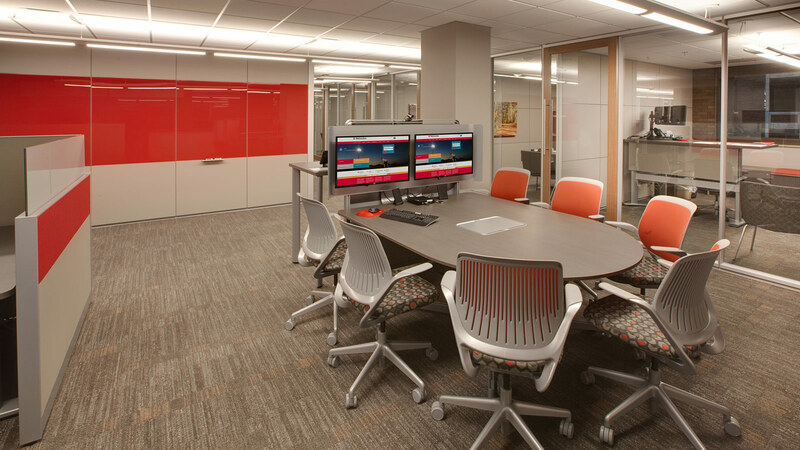 Most workstations feature sit-to-stand desks, giving staff members greater options. 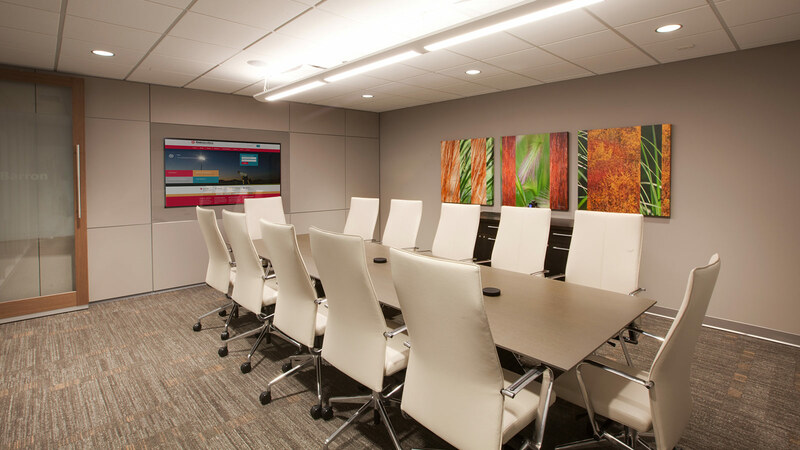 The DIRTT modular wall system’s movable partitions build in flexibility for future growth in a large, open team area. 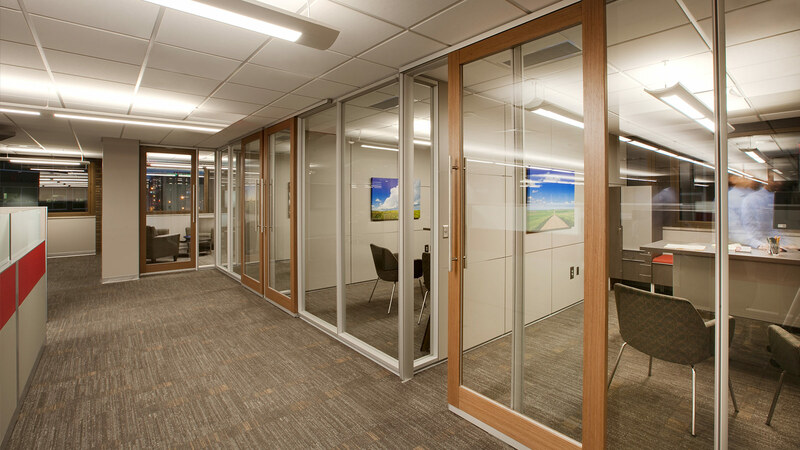 Adjustable glass panels with sliding doors create offices along the perimeter and borrow daylight to brighten work and client areas in the center of the floor plan. The design reclaims space for more public functions by decreasing storage rooms and qausi-vault areas for document hard copies. As the banking industry has become more computerized, digital records have replaced the need for oversized paper archives on site.